Shibanov Michael (SK. after 1789), the painter. From the serfs of Pereslavl-Zalessky. From 1783 Shibanov “free painter”. Creativity Shibanov suggests that he was influenced by D. G. Levitsky (perhaps learned from him). The early activities Shibanov is associated with the family of Admiral G. spiridov, the hero Chesmensky battle. In the 1770's by Shibanova in St. Petersburg was painted the portraits of his wife, sons, nephews Spiridov. Ser. 1780s Shibanov was a painter at G. A. Potemkin, performed work in the St. Catherine Church in Kherson. 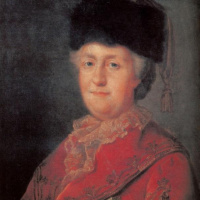 Then they were painted portraits of Catherine II in a travelling dress and her favorite M. A. Dmitriev-Mamonov (both 1787), portrait of V. S. Popova — Manager of a field office of the Potemkin. Shibanova referred to as the Creator of the peasant genre in Russian painting. Land artist Mikhail Shibanov belongs to the most peculiar and yet mysterious figures in Russian art of the XVIII century. About the life of Russian artists this time, including the most famous, we know very little, but Shibanov know even less than you about someone from modern masters. Archival documents do not give about him almost no information, and memoirists do not deign serf artist at least a cursory mention. Unknown even the date of his birth and death. We don't know what happened to him, how he became an artist, where and who attended. The number of his works that have survived to our time too will not be enough to clearly imagine the development of his work. If he did not sign his works, the name Shibanov is unlikely to become known to posterity. Meanwhile, this name is associated with outstanding for its artistic merit things — some fine portraits and two paintings belonging to among the best that created the Russian art in the eighteenth century. From the biography Shibanov we only know that his master was the celebrated grandee of Catherine Potemkin. Apparently, this has facilitated the artist's access to notable customers, among whom was the Empress herself. Shibanov accompanied her during a trip to Russia and wrote her portrait in Kiev in 1787. In the same year was painted the portrait of General A. Dmitriev-Mamonov, one of the most beautiful works of portrait art of XVIII century "portrait worthy of European glory", as we spoke about it later criticism. Portrait of Catherine, written by Shibanova, enjoyed great success in the XVIII century; on the orders of the Empress, it was reproduced in an engraving by George. Walker, and several miniature copies since it was performed by court miniaturist Zharkov. But most Shibanova Catherine showed deep disdain. Serf painter seemed to her unworthy of even a simple mention, and in a letter to Grimm, she wrote about this portrait as the work of Zharkov. In portrait work, 1787 Shibanov was already a well-established and Mature artist, occupying an independent place in the art of his time. Much less workshops are portraits painted by Shibanova earlier, in 1770-ies. He makes only the first steps to mastering portrait art, and one would think that these portraits belong to the period of his apprenticeship, if the same was not dated both his excellent paintings of "Peasant lunch" (1774) and "the wedding Feast of the contract" (1777). High scenic quality of these paintings puts them on par with the most outstanding works of Russian art of the XVIII century, and the thoughtfulness and originality of their design, accurate observation, keen psychological insight and perfect the ability to cope with complex multi-figure compositions testify to a great artistic experience and artistic maturity of the master. The themes of these paintings quite unusual for paintings of the XVIII century: they both depict scenes of everyday peasant life. In the aesthetics of the time genre art was given the most inferior, subordinate place. The image of modern reality was not a challenge worthy of an artist. People's images were, in fact, removed from the sphere of official art. However, in the Academy of arts in 1770-1780-ies there was a so-called class home exercises, where he studied domestic painting. But scenes from "tough" life of ordinary people, of course, were not allowed there. Shibanov was the first Russian artists turned to popular images and subjects taken from peasant life. What has been done in this area to Shibanova, barely worth mentioning. The Russian peasants portrayed visiting artists-foreigners— French Le Prince, in 1758-1762 years has made a number of drawings (repeated subsequently in print) on everyday topics Russian, and Danish Eriksen, the author of the peasant group portrait. The Le Prince embraced Russian life as "Eastern exotic", strange and implausible, but naturalistic painting Eriksen has no educational or artistic value. Foreigners who are not familiar with Russian life, could not, of course, to lay the Foundation of strong traditions. If Shibanov and knew their work, but in any case, had a right with them is not considered. His only predecessor was A. Losenko, who used the peasant character in the historical film "Vladimir and Rogneda". Bearded soldiers in helmets depicted Losenko, the impression painted from life of Russian peasants. But by introducing into his picture of popular images, the artist-academician was forced to resort to "historical" reasons. And Shibanov, not bound by academic standards of aesthetics, directly reproduced in his paintings vibrant scenes of contemporary national life. The "peasant lunch" represents a careful and accurate sketch from life, which truthfully and accurately transferred to characteristic types of peasants. The artist sought here primarily to live the naturalness of the image. "The celebration of the wedding contract" is much more difficult and significant. Here before us is not a full-scale sketch and finished the painting with a well-found type, with a thoroughly thought-out multi-figure compositions, the film, which knowingly shipped and successfully .solved pravoohranitelnye and psychological challenges. "The picture representing the Suzdal province peasants. the wedding feast the contract, wrote in the same proussy of self Tatariv V. 1777. year. Mikhail Shibanov". About the nature of this festival we know from ancient descriptions of Russian peasant life: "Conspiracy consists in the exchanges of the gauge, and small gifts. The groom comes to see the bride. Collusion this is sacred and inviolable". But, along with features of an acute and penetrating realism, "the wedding Feast of the contract" clearly present and features of the idealization of peasant life. They are reflected in the decorative system of the composition, emphasizing the elements of solemnity and festivity that permeates the whole picture Shibanova.